In a world of 7 billion cell phones, wireless service providers are always searching for ways to maximize the efficiency of wireless spectrum to improve service. The so-called "half duplex" radios that comprise today's cellular base stations perform two functions: They send signals and receive signals. Yet, despite a decade of dizzying advances in speed, they still can only perform one of these functions at a time. Full duplex radios have long been a tantalizing proposition because they are capable of sending and receiving on the same frequency simultaneously, potentially doubling spectral efficiency. If used in smartphones, they would allow simultaneous uploading and downloading. However, they also generate double the amount of interference, constraining their deployment. 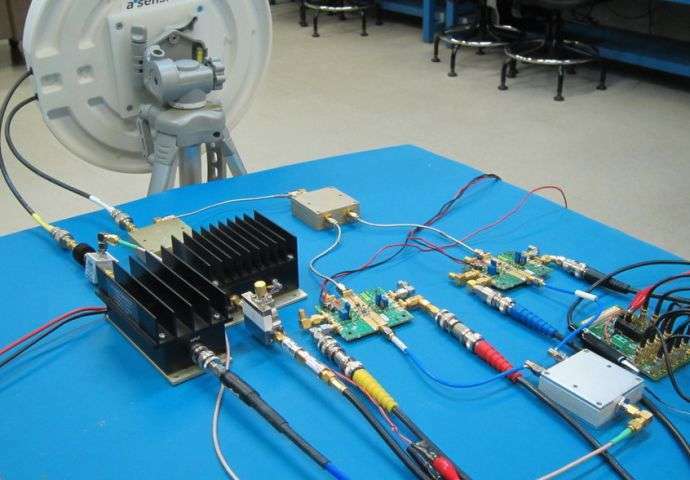 Researchers from New York University Tandon School of Engineering and Trinity College in Dublin, Ireland, have conceived a method to improve spectrum efficiency by deploying a mix of half and full duplex radios in base stations. Their paper, Throughput and Coverage for a Mixed Full and Half Duplex Small Cell Network, recently won Best Paper at the IEEE International Conference on Communications (ICC) in Kuala Lumpur, Malaysia. ICC is one of the world's premier telecommunications research conferences. The research team was led by Shivendra Panwar, professor of electrical and computer engineering at NYU Tandon, and Sanjay Goyal, a doctoral student, along with Assistant Professor Nicola Marchetti and doctoral student Carlo Galiotto, both of Trinity College. Panwar likened the use of full duplex in a cellular network to being at a crowded party where everyone is attempting to talk and listen at the same time. "Even if you were capable of speaking and listening at the same time, everyone around you would be doing the same thing,' he said. "It would be impossible to tune out that extra noise, and the same is true in a full duplex system. There are many more outages and dropped calls due to the high level of interference." Noting the advantages of each system—full duplex radios offer superior efficiency while half duplex radios provide a wider coverage area—the researchers hypothesized that mixing full and half duplex cells could allow wireless providers to customize networks to meet demand and improve spectral efficiency as needed without excess interference. They generated mathematical models of base stations with varying configurations of half and full duplex, then ran simulations to predict the trade-offs in efficiency and coverage areas. To the researchers' knowledge, this is the first study to investigate the impact of mixed-cell base stations on spectral efficiency and outages. Their models are readily applicable for wireless engineers seeking to improve their networks. "The beauty of this system is that it's tunable and would allow providers to adjust the mix of cells based on the needs of a region," said Goyal. "If you're designing an urban network, the demand for bandwidth is much greater than the need for wide-area coverage. More full duplex cells would provide that bandwidth, even at the cost of a few more dropped calls," he explained. The reverse is true in less dense areas, where spectral efficiency is less crucial. Additionally, because download traffic far exceeds upload traffic on most networks, the team showed that a mixed-cell system could enable faster downloads at the expense of upload speed, which is less likely to be noticed by customers. That's the reason I do NOT give up my hard wired land line (not VOIP from anyone). The duplex issue is readily apparent while talking on the cell phone. How many times have you and the caller tried speaking at the same time only to have both of you back off talking so the other can go ahead? It can be a horrendous ordeal with gaps and over talking with others. The "full duplex" allows two way conversations without cutting off the other side just like a live conversation (and the old land line). Cell phones can be a lot like the "walkie talkie's" of old. They were half duplex and painful. So are cell phones.